888 are one of the largest sportbetting and gaming companies in the world. Major sponsorships can be seen across snooker, football and poker. Their sportsbook offer is a simple 'Bet £10 Get £30'. Some users are reporting errors with the website not loading properly on Google Chrome or Opera. If this has happened to you, then follow these quick steps. 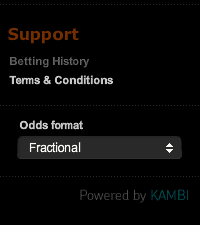 4) Scroll down to "Pop ups & redirects" and click "allow"
Start by signing up to Betfair (if you do not yet have a Betfair account) using the below link. Then, sign up to 888 Sport and deposit £10 to receive the Bet £10 Get £30 offer. Then enter promo code 30F when making your first deposit. a) Choose a popular league or cup on 888sport. b) Choose team(s) above the 1.5 minimum odds on 888 Sport. The 3 x £10 free bets are added shortly after your trigger bet is settled. Note 1 x £10 free bet needs to be used via your mobile phone and the free bets expire within 7 days. Enter £20 in the Calculator for the stake (as £10 needs to be used on mobile - so do £20 now, and then go on mobile for the final £10). 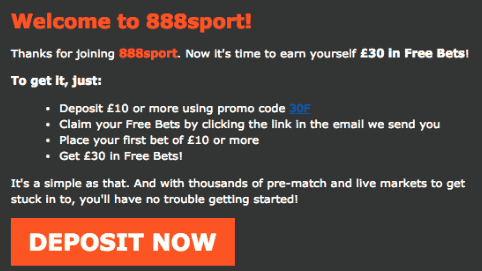 Use the 888 Sport free bet in the betslip. Then go to mobile and use the Mobile free bet too. Easy money! If your trigger bet or free bet won in 888 Sport, then withdraw these winnings. Mark the offer as complete and let's get cracking with the next offer.